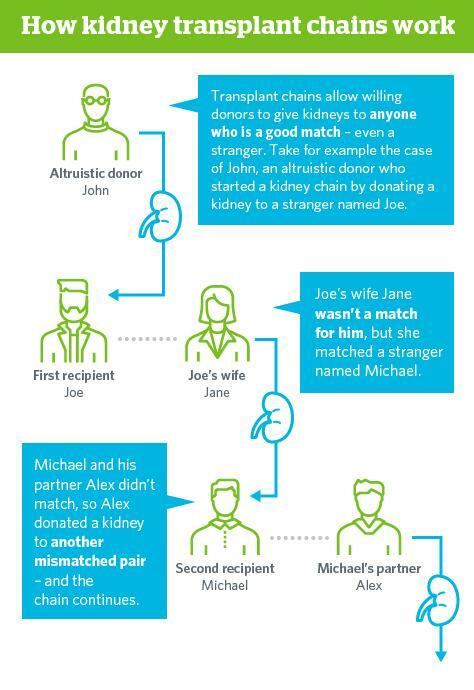 "We know through previous studies that kidney transplant chains are incredibly important, but our research has found that adding just one altruistic donor to a kidney exchange – thereby creating a chain – can lead to substantially more kidney transplants," explains lead author Yichuan Ding, assistant professor at the UBC Sauder School of Business. "Our findings will greatly benefit patients, especially those who are hard-to-match." Allocating donated kidneys to deserving patients with end-stage renal disease is an important challenge in today's health care system. According to the Canadian Institute for Health Information, in 2015 there were 2,858 patients waiting for a kidney transplant, with 604 kidneys originating from deceased donors and living donors providing 383. "Right now, the longest kidney transplant chain in the world has completed 88 transplants since 2013, with additional surgeries still scheduled," Ding says. "We believe our algorithm could be incorporated into current medical decision-making tools to extend this chain even longer, further improving accuracy and speed of matching." The study, "A non-asymptotic approach to analyzing kidney exchange graphs," was co-authored by Dongdong Ge and Simai He, both from Shanghai University of Finance and Economics, and Christopher Thomas Ryan from University of Chicago Booth School of Business. The article is forthcoming in Operations Research.